Explore triangles as you create a winter scene. 1. Gather your material. 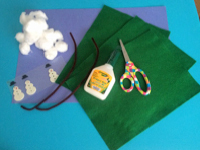 You will need a large piece of blue construction paper, green felt, scissors, white glue, cotton balls, brown pipe cleaners, and snowman-shaped stickers (optional). 2. 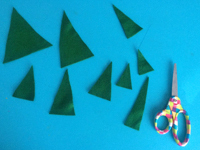 Cut several triangles (different sizes) out of the green felt. They will become pine trees. 3. 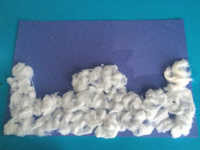 Apply white glue at the bottom of the blue construction paper (placed horizontally) and press cotton balls on the glue to represent snow-covered hills. 4. 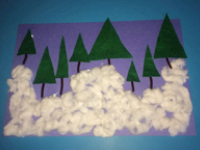 Glue the triangles (pine trees) here and there above the cotton balls, sliding a cut pipe cleaner under each one to represent tree trunks. 5. 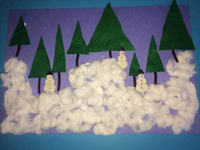 Add your snowman stickers here and there to complete your winter scene. 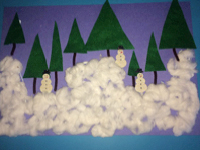 Display children's artwork on a wall and write "Happy Winter! ".